The Northern New Jersey Community Foundation’s ArtsBergen initiative announces the eight artists selected for Creative Hackensack’s “Utility ARTBox Project”. The artists will paint murals with anti-littering messages on eight utility boxes on Main Street and beyond in Hackensack, New Jersey. The artists are: Monica Chavarria of Teaneck, Lawrence Ciarallo from Hoboken, Tai Hwa Goh of Fort Lee, Jonathan Houssou and Marcus Story from Englewood, John Newcomb of Bergenfield, Poramit Thantapalit from Hackensack, and Kenneth Ziobro of Hasbrouck Heights. The artists have worked on a range of murals or public art projects. Ciarallo has extensive experience creating murals in South Orange, Jersey City, and Newark, including the Model Neighborhood Initiative. Goh, an artist-in-residence at the Museum of Arts and Design’s Artist Studios Program in New York City, worked on BRIC House and the Dumbo Art Festival in Brooklyn. Thantapalit’s portfolio includes creating public art for Boonton Arts’ Dog Days of Summer and developing a mural wall for a restaurant in New York City. Ziobro, who undertakes over 12 annual shows in front of an audience, also creates caricatures and pet portraits. Previously, Newcomb, a tattoo artist at Lola’s Tattoos in Bogota, and Chavarria participated on the artists team that painted the 250-foot Main Gateway Mural at 76 Main Street in Hackensack. Chavarria has also created murals near Paterson Great Falls National Historic Park and in a school’s library in Fort Lee. Houssou, who is also a musician, and Story were contributing artists to Creative Hackensack’s two CAT Walk Art Exhibitions in 2016. The community is invited to watch the artists paint the murals on the utility boxes on Main Street on Saturdays, June 24 and July 8 from 10:00 a.m. to 4:00 p.m.
Funding for the project is provided in part by a Clean Communities Grant awarded to the Hackensack Cultural Arts Department, with a primary focus on litter prevention. Each utility box will serve as a canvas for a painted mural illustrating a clear message of anti-littering, litter prevention, the damages of littering to a community and how anti-littering behavior enhances an area. ArtsBergen is partnering with the Hackensack Main Street Alliance’s Creative Arts Team (CAT) and the Hackensack Cultural Arts Department to implement the project. ArtsBergen offers public and community art project development and management services to communities in Bergen County. The NNJCF’s initiative developed the “call to artists”, recruited the artists, and managed the submission and selection process. The CAT, a group of Hackensack community members, developed a Creative Vision Statement outlining a creative placemaking plan for the city. Creative placemaking integrates arts and culture into a neighborhood, town, or region to build community and livability and boost the local economy. NNJCF’s ArtsBergen played a key role forming the CAT in 2015 and continues to collaborate with CAT, the City, and the Alliance to implement the plan. The Utility ARTBox is among several projects the CAT has identified to implement its Creative Vision Statement. “Part of ArtsBergen’s mission is to encourage municipalities to engage in creative placemaking. Hackensack embraced this process of infusing art into its infrastructure, supporting local artists, and building a grassroots network to bolster its redevelopment plans via art and creativity. The Utility ARTBox is an example of the collaborative nature of creative placemaking. 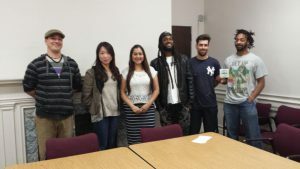 We are excited to work with a talented group of artists to help make Hackensack more vibrant through art and positive messaging,” explained Danielle De Laurentis, NNJCF Associate Director. “The Main Street Business Alliance, in partnership with the Hackensack Creative Arts Team and the Northern New Jersey Community Foundation, is pleased to support the next downtown Hackensack art installation. The Utility ARTBox Project illustrates our commitment and mission to revitalize Hackensack through arts, creativity and culture,” said Patrice Foresman, Executive Director, Upper Main Street Alliance.